Unlike many other nations who fought in WWII, the Germans and Soviets were not as finicky about the "NIH" syndrome – "Not Invented Here" – and would put each other's military equipment into service at the front lines as a matter of course. They also set up conversion and maintenance programs, which ensured that some of this technology could be reissued and kept combat ready in small lots. The Soviets got into the swing of this later in the war, and had factories set up to strip out captured Pzkw. III tanks and StuG III SP guns for parts. They converted a number of the former into the Su-76I SP gun (I for "Inostranets" or foreigner) with a Soviet 76.2mm F-34 gun. The Germans also did the same to both captured and acquired equipment. Their greatest successes were with the assimulated Czech tanks and artillery, but they also used French, Italian, British, American and Soviet equipment. The main problem with the latter was that they tended to fight their equipment out and rarely surrendered, making it hard to find serviceable units to assimilate. Nevertheless, with the thousands of T-34s built the Germans were able to get their hands on enough to make it worthwhile to modify them to German standards and put them into service. The most common (and the only one which has been heavily photographed and documented) was the T-34 Model 1942, the so-called "T-34/76D" to the Germans, with the larger three-man hexagonal turret. There are a good number of photographs of what the Germans designated the "Sd.Kfz, 747(r) Pzkw. T-34" and according to the Chamberlain/Ellis/Jentz encyclopedia some 50 of these were on hand prior to Kursk; only 17 are noted as being operational. This kit is the beautiful DML June 1941 production T-34 kit with two new sprues adding all of the external German modifications to it (stowage bins, pioneer tools. "Notek" lights) and also a Pzkw. III style cupola. I am not doubting the fact somebody found record of this for DML, but so far I have been unable to locate such a modification to a Model 1941. The main problem with that tank is that it had a four-man crew, of which the commander also had to serve as the gunner. There was little, if any, room for a commander in that turret, and putting a heavy German cupola on the turret would really limit the ability of the crew to exit the tank in a hurry, thus turning it into a death trap. The ONLY evidence I can find of this conversion taking place is a painting in a book – on page 13 of the Polish "Militaria" Publishing Book "Tank" Number 38 - T-34/76 is a T-34 Model 1941 of an unidentified unit in Vyborg, July 1944. This shows a plajn green tank, bort number White "154" with only the German Pzkw, III style cupola added, and none of the external kit. No photographs are provided of this conversion. There is not even any comment to whether it was captured or used by the Soviets or Poles. All it shows is the tank. A photo of this tank IS found on page 50 of Concord book #7011, "Soviet Tanks in Combat 1941-1945" by Steve Zaloga. The tank here is clearly identified as belonging to the 21st Army, Leningrad Front, and the date given is 20 June 1944. It is the same tank, White "154" (also on the glacis of the tank). This poses a conundrum, for while there is physical evidence that the Model 1941 was captured and refitted by the Germans (as the one preserved at Aberdeen Proving Ground shows) it does not appear to have been fitted with the cupola by the Germans. On the other hand, we have photographic evidence of a Soviet one with the cupola (but no German fittings other than the cupola) and in Soviet service in mid 1944. 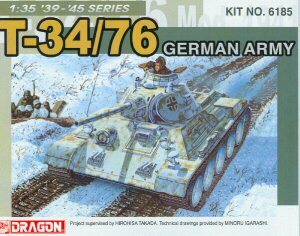 Therefore, to be as accurate as possible, I recommend building the kit with the German equipment BUT without the cupola if you want to make a German version. Build it with all of the Soviet fittings AND the cupola if you want to model tank 154. The only other option would be to get a Zvezda T-34 Model 1942 and swap turrets and tracks, as well as find a set of horizontal (longitudinal) vents for the radiator air intakes. Then you can use all of the German parts to make an accurate "Pzkw. T-34" backed up by photo evidence. That being said, the new parts for the kit are first-rate, with the cupola consisting of 18 parts and giving the modeler the option of having the vision slits open or closed. The kit comes with German outer vehicle materials - pioneer tools, such as a shovel, wire cutters, pry bars, three stowage bins and a stowage rack. They also show (based on the Aberdeen tank as well as photos) that four more track links (two "A" and "B" pairs) are fastened to the rear sides of the tank above the standard Soviet mounts. Two tank finishing schemes are shown, both winter 1941. I cannot corroborate those schemes with the cupola on this tank, however. Overall this is a nice kit – it could hardly fail to be using the DML Model 1941 as its base! – but one that does not seem to ever have existed in this format. If anyone has photo evidence of one, please let me know!